This Glossy self-adhesive paper is characterized by exceptional toner adhesion and permanent self- adhesive backing. Specially treated surface of this self-adhesive paper provides optimum feeding and a vibrant colour reproduction on white glossy background. High quality adhesives are colourless and not yellowing. For use on colour and monochrome laser printers and copiers. 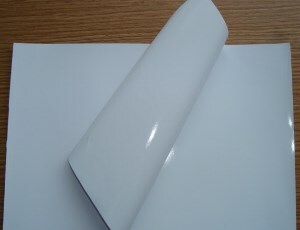 Wholesale price when buying packs of 100 sheets.